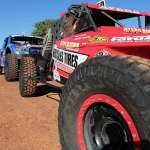 After almost seven months, the 2019 BFGoodrich CAMS Australian Off Road Championship is back and the town of St George was buzzing with buggies, trucks and anticipation. With more than 70 crews taking part in the Cobb & Co Hotel St George 399 this year, hundreds of fans made their way to the St George Showground to get up close and personal with this year’s class of vehicles. While the main purpose of the day is to get a feel for the course and get the cars ticked off in Scrutineering, all the country’s best off roaders were in the one spot sharing their good vibes in what was a fantastic atmosphere. On Saturday morning, the action begins with prologue when Richie Swain starts at 7:55am local time. Click here to view the prologue starting times. Ahead of the season opener, aorc.com.au spoke to a few of the competitors about the event and how they’re feeling ahead of it. Click here to view the schedule and the Supplementary Regulations.